WALKING WOUNDED IN SEARCH OF THE TYPEWRITERS OF PRAGUE. Last weekend saw me doing a spot of DIY, a 7 mile walk, heading to a certain Swedish Furniture store and watching Tamworth FC throw away a two goal lead to draw 2-2 with AFC Telford. So no writing got done, but it was good to catch up on a few jobs, get some exercise and support my local football team without worrying about not producing anything literary. I will have to start thinking about where next with my work; my personal work tends to drift when I have so many projects on the go. Another two are in the offing – one for the end of September and another for November so in between times I need to focus on crafting my poems for submissions to magazines something I know I should do but never seem to find the time. I have a couple of readings coming up in September, where I would like to read some new poems on my experience in Cork, so I plan to work on them this week during my writing time. I have an idea of what I want to do, but have not got it clear in my head how I want to say it in a poem. So I need to walk with the ideas for a little longer. I don’t believe in writers block as if something is not coming to the fore when I write then I believe that I have not thought it through enough. Thinking for me is not a forced process, I cant just brainstorm and idea from my conscious, I need the thoughts from the un-conscious to tease themselves out into consciousness so that I can use them. This takes time and I tend to walk with the ideas pulling them together until I have that flash, the light bulb moment and it all comes together. I find doing jobs such as the odd bit of DIY or walking are very therapeutic to my writing mind as I am focussed on more physical activities that make me think of other things; measurements, cutting angles, distances, fresh air, avoiding puddles, giving me that sideways glance at what I want to write, only then seeing the angle that will create the structure that I want to write about. I received an email from a fellow writer and good friend of mine, who is a Brit based in Prague. Paul put off going to spend two years in the Czech Republic, despite the encouragement from his fiancé but is the first to admit he should have done it a long time ago. He has not only finished his first novel in the short time he has been there, something he has been working on for the last 3 years, he has found gainful employment teaching English and is also writing a blog on the more unusual, lesser known aspects of being a ex-pat in Prague. His blog documents his interests and tries to counteract the impressions of Brits as being drunken stag parties that Prague has over recent years become all to familiar with. The blog at www.guiriguidetoprague.com so far covers his settling into his new life and the search for a typewriter, which doesn’t surprise me as I always see Paul as a writer in the mould of Hemmingway and Kerouac, typing away at his work on an old Imperial typewriter. I somehow can’t see Hemmingway or Kerouac with a laptop and word-processor, which is funny really because I can hear J.S.Bach with a synthesiser. Do take a regular look at Paul’s blog and expect the unexpected. Having said above that I have not written anything, that is not entirely true. 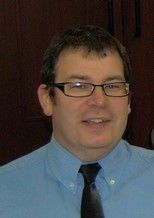 It is another good friend and fellow poet, Gary Carr’s 50th Birthday this week and I can’t let it pass without returning the favour he did me on my 50th, that is to write a poem in celebration. I will send it to him on the day and may well read it at Spoken Worlds. His poem for my Birthday was absolutely wonderful and I only hope mine in return lives up to the mark. Gary Carr - A poet in a tie. Most pupils of my generation studied First World War poets as part of their O’levels, the poets were British: Brooke, Sassoon, Owen et al. We were never encouraged to consider that Germans had their own poets. The reason for this could be the lack of translations from German to English; we studied French and not German. There could also be the sensitivity that World War II had only ended 30 years previously and that the educationalists decided to avoid German war poetry. Having said this we did study both Wars including a German perspective in History. As we head towards it being 100 years since the outbreak of the Great War, I think that we should consider the poems of Stramm, whose style and voice was distinctly different to his British counterparts. Stramm is considered to be one of the early Expressionist poets, whose style sought to express meaning and emotion rather than reality. Stramm is very much a modernist voice, with stripped back, terse, stark poems where every word conveys a bleak terror or haunted feeling. 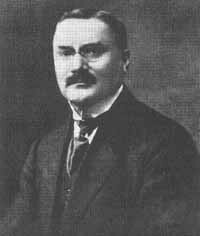 Stramm was born in Münster (Westfalen) in 1874; the son of a civil servant. His early career saw him working for the German Ministry for the Post Office. He completed his mandatory military service in 1896/97 and is known to have made several trips to the USA between his military service and 1900. He married in 1902 and by 1905 he had settled in Berlin. In 1912 / 13 he wrote two plays Sancta Susanna and Die Haidebraut both of which were performed before the outbreak of war. His poetry flourished due to his acquaintance with the Berlin publisher Herwath Walden who had established the Expressionist journal, Der Sturm. With the outbreak of War, Stramm as a reservist was called up and reached the highest rank for a civilian that of Captain. He saw action on the Somme and Alsace for which he received the Iron Cross (2nd Class). He was stationed on the Eastern Front when he was killed in action at Horodec in September 1915. Stramm’s poetry does not rely on the reader making historic associations or use of Latin that his British counterparts did. His short poems fire bullets of expression into the silence and let them echo in your thoughts. Normally starting with a long line they pair down into single words as they progress, as if he is trying to squeeze the last breath out of every poem. These poems do not retreat or provide answers, they do not moralise on the situation. They just describe it as it is: blood, killing, murder. There are links below to some of his other poems in translation or versions. But my little knowledge of German has left me dissatisfied with some of the translations and interpretations. These are really powerful voices – voices that still resonate in contemporary poetic parlance. I felt I needed to go back to the original German and to work on my own interpretation, which I have done below with his poem Wunde (Wound). Wound – English Translation/version by Mal Dewhirst. This translation or response differs from other translations, some literal others poetic, seeking to get into the expressionist mind. My translation, whilst trying to hold on to the meaning and feel, uses my current preference to an alliterative style. I have also taken the view point that it is a poem of the Earth, the viewer describing the Earth as personified participant in the battle. This again is a preference of mine in my own poetry, but in this case I think is also Stramm’s intention, he personifies frequently in his poetry, describing iron as sleeping. I see this as the wounded Earth, his solitude and distant gaze. The Earth is male, which is at variance with the normal thinking i.e. Mother Earth, also the Germanic Fatherland, which is little used these days because of its connections with the Nazi’s. Fatherland or Vaterland in German is an expression that was in frequent usage far before the rise of the Third Reich. Versions of August Stramm by Alistair Noon. First World War site for Poetry and Prose. – Antony Owen will be reading from his collection the Dreaded Boy at the FIZZ in Polesworth on 20th September. THE BLATANT RESISTANCE OF WILD DAISIES. Fully able drivers who park in disabled parking spots because it is more convenient for them. The successes of GCSE and A’Level students that I know – Well done to them all. Rainbow Dome Music – Steve Hillage. A shorter blog this week as I published my reviews of Cork and Limerick earlier in the week. 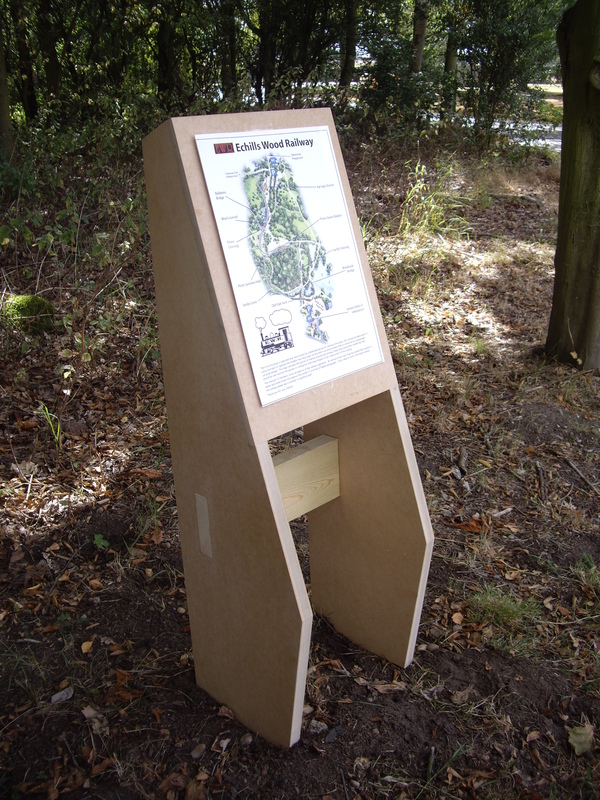 Things are moving forward on the Polesworth Poets trail, with the designs and production of the installations. A sample lectern has been produced in MDF, there are some slight adjustments to the design but the final lecterns will look really good in Oak with a leaf inlay. The poems are with the designer to produce the layouts for the installations on to stainless steel, leather and slate. Plus designs using appropriate fonts have been produced for the laser cut installations where the letters will be cut into sheet steel. So things are moving on and I will hopefully be able to let you know when the installations start fairly soon. September is upon us, where does the year go? Another Fizz will take place on 20th September when we have the Coventry Poet – Antony Owen reading from his second collection The Dreaded Boy, plus an open mic. All are welcome; it is free entry at Polesworth Abbey. My lost poet this week is Bub Bridger (1924 – 2009). Bub was suggested by a writer friend of mine from New Zealand, Kirstie Brooks. Following my blog on the Australian Poet Banjo Patterson, Kirstie suggested that I might be interested in featuring a Kiwi poet and passed on Bub’s details. The story goes that Bub was born into a very large family who rather than think up a name for her, called her Bub, she was stuck with it for the rest of her life. Bub was born in 1924 and grew up in Hawkes Bay. She was married and had four children, but the relationship broke down and she raised them on her own. She didn’t start writing until she was 50 and drew on her English, Irish and Maori (Ngäti Kahungunu) ancestry for inspiration. Her work is full of wit and idiosyncratic fantasy that makes it easily accessible. She is also noted as a performer and was a member of the Women’s comedy group Hen Teeth. She also wrote short stories and plays, writing for both radio and television. Her work mostly appeared in anthologies but her collection Up Here on the Hill was published in 1989. She was a great promoter of women writers especially those from New Zealand and it is reported that on a visit to London as a guest of the International Feminist Bookfair that she brought a suitcase full of books of New Zealand Women writers to show that their was an active group of writers who needed a wider readership than their native country. She died in Westport, New Zealand in December 2009. Wild Daisies – thematically similar to Brian Patton’s Blade of Grass, but with a variance as Patten tries to give a single blade of grass to show his love, whereas Bub as the recipient of a love gift only wants Wild Daisies that the giver has risked his life to get them. It is a wonderful snippet of life that says the simplest of things mean the most and should be the real treasures that we seek. It amused me that their was a link to Interflora New Zealand under the version on this web version below, especially as the poem is an anti-flower shop poem, it makes me wonder if some business’ actually read and understand the poems they link their business too, well it is about flowers so it must be appropriate for a flower shop business, I suggest that they read it again. Wild Daisies – Bub Bridger. A Blade of Grass. – Brian Patten. Another poem Blatant Resistance follows the themes of Warning by Jenny Joseph. Bub with her scarlet coat wandering around like a fire engine resisting the onset of old age. If Joseph had not written Warning then this would be the delightful poem on the theme of growing old. However, I think Joseph does it better and although Warning is a bit of a cliché these days and is perhaps the only poetry book to be found in most garden centres – I suspect that this is in the hope that most customers of garden centres are likely to relate to it. Blatant Resistance – Bub Bridger. AN GUTHANNA CHORCAÍ AGUS LUIMNIGH – THE VOICES OF CORK AND LIMERICK. READING AT O’BHEAL – CORK. My first reading of the tour was hosted by O’Bheal at the Long Valley pub in Winthrop St. The Long Valley is a traditional Irish pub; with its fair share of stout, ale and ciders. The Poetry readings take place in the Hayloft the upper room of the pub, which is a wonderful room that holds around 50 people at a push. The bar has a stone horse’s head displayed at the corner, which was sculpted by an ex-bar man who went on to establish his name in the art. The evening starts at around 9:00 with a short 5 word challenge, where the audience determine five words, all to be used in a poem, which they then spend about 15 minutes writing, followed by readings of the poems in no particular order as the mic is open and poets get up and read their offerings when they feel like it. There is a certain tension, perhaps not wanting to be first or just timing it right to get the best response, so your eyes flick across the room looking for the next reader, in anticipation on who will do what with the five words. The winning poem is selected by the audience response, on the night it was the Right Honourable Lord Mayor of Cork City, Terry Shannon, whose poem won the audience appreciation and will be included in the anthology of five word challenge poems that is produced by O’Bheal at the end of each year. The Lord Mayor, was there to show his support for the work that O’Bheal do in developing and promoting poetry as part of the twin cities initiative and also to welcome me as a representative of Coventry on the literature exchange, which he did in his speech, also talking about the importance of the visits. He was fine speaker and man very proud of his city and so he should be, it is a fine city. It consisted of my poem about the M42, which is the only poem I have written that mentions Coventry, followed by my place poems that relate to Birmingham, Cotton Mills, the Yorkshire Dales, finishing with some of my music themed place poems with another on Birmingham and Punk Rock, My Liverpool, Beatles poem, finishing with my Memphis Blues poem which I dedicated to Rory Gallagher. Readers included Sue Cosgrave, who was part of the exchange last year, Julie Field who sang a self penned song that mixed Irish Gaelic and Tibetan lyrics. Other readers were: Jo Collins, Afric McGlinchey, who will become to the UK as part of the exchange in November. Also reading were Patricia Walsh, Laura Dunne, Tom McCarthy, Rab Urquhart, Mary Brennan and Simon Deasy, all very accomplished poets who explored so many themes with their unique voices. We were delighted by the song of Lady Grew, originally from Ohio and now touring festivals and open mic evenings in Ireland, delivering her unique mix of reggae and sometime operatic sounds, which finished of an excellent evening of poetry from such varied voices. The night was young and further hours were spent drinking ales and stout and talking poetry in the Old Oak pub around the corner, to some accompaniment of traditional music, slowly the crowd thinned down and the music faded and we headed home at around 2:00am. If you are ever in Cork City on a Monday Evening – then do head to Long Valley on Winthrop Street for an evening of Poetry – it starts at 9:00pm – with free entry, 5 word challenge, a guest poet and open mic. You won’t get a better welcome anywhere from a group of really accomplished poets. Tell them I sent you. READING AT THE WHITEHOUSE – LIMERICK. The Whitehouse Bar on O’Connell St, Limerick is the home of the weekly poetry readings, hosted and organised by Barney Sheehan. The bar is split into two parts, one for poets and one for drinkers with the poets reading in the small curtained corner known as the Poetry Theatre. The night I was there, I was one of two guest poets, the other being the Galway Poet Elaine Feeney, who read from her collection published by Salmon, Where’s Katy. Her poems are mix of imagery and feelings sometimes dark that live in the reality of her experience and acquaintances. Her main set was some of the darker poems that she rarely gets to read as she has several light whimsical poems which her audiences expect her to read. She did not get away with not reading her poem Urban Myths and the Galway Girl, which was constructed from a series of thoughts and sayings of one of her co-workers, whose moans and groans and offers of advice are cleverly crafted into this wonderful poem. The Whitehouse performances are video’d and you can see Elaine’s performance here. Her book “Where’s Katy” published by Salmon is an excellent collection and well worth seeking out. There then followed an open mic, which included the excellent Terri Murray, reading from her collection Where the Dagda Dances. Terri had run out of copies by the time I asked to buy one, but I paid her for it anyway and gave her my address and two days later it arrived with a wonderful inscription. Other excellent readers included Clare Dollard,Paul Casey from O’Bheal In Cork, Shelia Fitzpatrick O’Donnell, Christy O’Donnell, Sara Andgren, Rose O’Shea. Mark Whelan, Paul Massey, Terri Murray and Barney Sheehan the Whitehouse Poets M.C. There was also a group from the W.B Yeats Society in Dublin who came to listen. 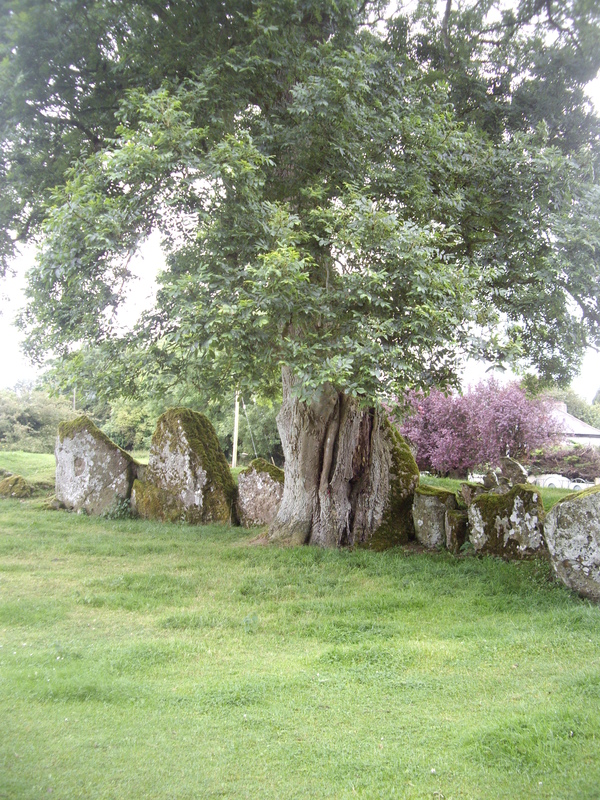 My set was similar to the one I read at O’Bheal with some interesting contrasts, such as the tree at the Grange Stone Circle brought thoughts of my Malham Cove poem, where the tree cleeves the rock. You can see my reading in the two clips below. The evening and the trip ended with a drive back to Cork and another 2:00am arrival at the B&B. The Whitehouse Poetry evening is every Wednesday in the Whitehouse Pub on O’Connell St. Limerick, it starts at around 8:00pm another evening that should not be missed. Ó BHÉAL, AN GUTH FILÍ : BY MOUTH, THE POETS VOICE. CORK and Limerick were my destination last week, as I was the guest of O’Bheal (pronounced O’vale) in Cork City for a three day visit of readings as part of the Cork-Coventry Literature exchange. This blog post is part poets journey and part tourist guide of my trip to this fantastic treasure of south west Ireland. Cork is a place to be explored, savoured and then to sit quietly and breathe. My flight out of Birmingham was early on Monday morning, so I arrived at just after ten to meet with Paul Casey, the poet who runs O’Bheal. O’Bheal which mean “by mouth” is an organisation that develops and promotes poetry in Cork, through readings, films, workshops and co-ordinating the Cork side of the Coventry-Cork Literature exchange. My first afternoon gave me the opportunity to explore Cork City for myself and as readers of this blog will know I like to track down my musical heroes and Cork gave me the opportunity to seek out Rory Gallagher, who grew up in Cork and formed his band Taste there in the late 1960’s. My first port of call on my hunt for Rory was Gallagher’s pub on the corner of MacCurtain and Bridge St’s, the pub named in his honour. MacCurtain St was where he lived with his Mother and Brothers when he was growing up. 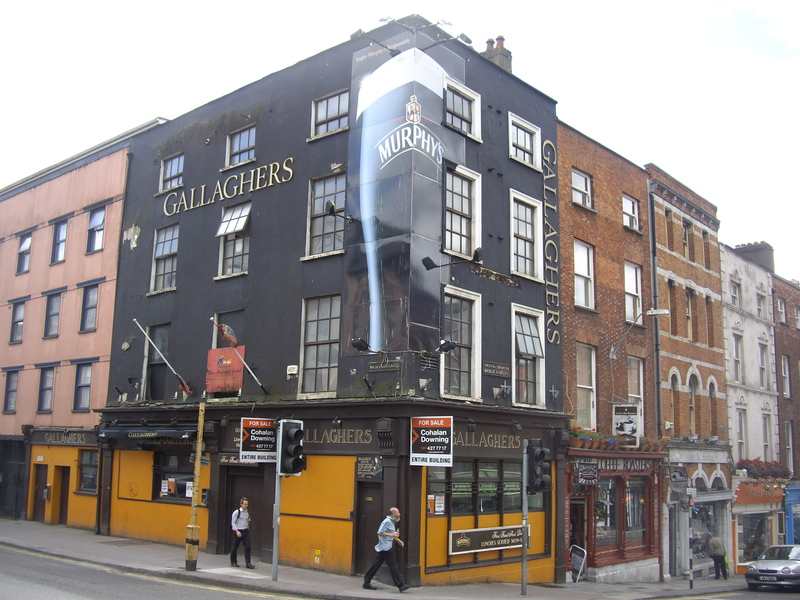 The pub painted in Black and Orange and adorned with adverts for a famous Stout; the name GALLAGHERS emblazoned in Gold letters on the upper wall, with a hand painted sign above a doorway that declared homage to the great Irish blues man. The pub was unfortunately closed and had a for sale sign above the main door, which suggested to me that it was no longer a going concern. 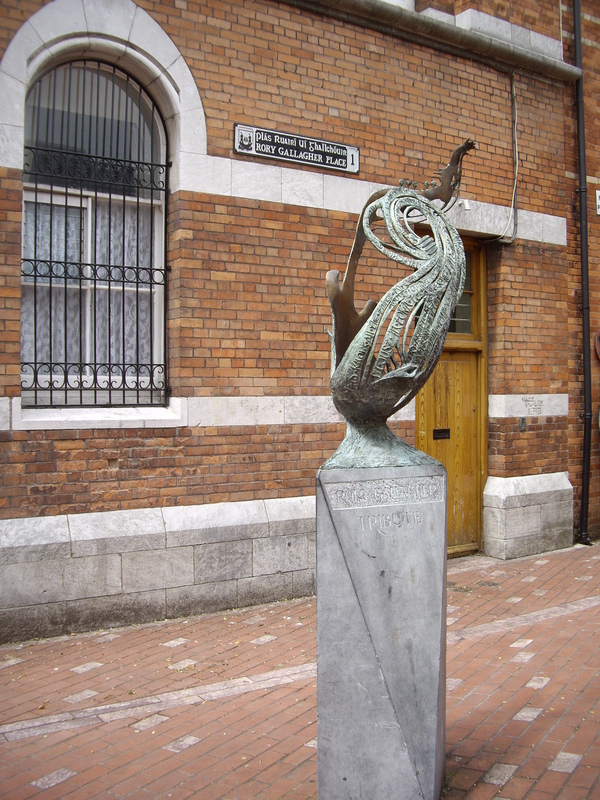 The next place on the trail was Rory Gallagher Place, a square in the St Peter and Paul area of the city, outside the front of the Tesco store. On the left hand side of the square was a tribute sculpture, made up of word strands from his album Jinx on one side and mis-formed guitar on the other, cast in bronze, the sculpture sits at the side of the square as the sound of a busking blues guitarist drifts in from down the street, surely there could be no better tribute. The library on the Grand Parade also has a music section called the Rory Gallagher Music Library, where there are a few artefacts such as guitars and a belt with his name on it along with some photographs from his time in Cork and the band Taste. The rest of the afternoon was spent wandering around the shops and the fantastic English Market, where fresh local produce is sold. Everything from meat to fish, to vegetables to artisan bread and fancy cakes. It is a foodies delight and if I lived in Cork I would shop there everyday to seek out the freshest ingredients for delightful dinners. When the Queen visited Cork back in May, it was the English Market that hosted her visit and there were some delightful photographs of her spending time with the stall holders, especially Patrick O’Connell who runs the Kay O’Connell’s fish stall, which was started by his mother. The Evening reading at O’Bheal will be covered in a separate blog post. The framed portraits of the Martyr Mayors, Tomás Mac Curtain and Terence MacSwiney who gave their lives for the Irish struggle for independence during the 1919/20. The Republican Silver salver, one of a very few pieces that could not be sent to the Assay office in Dublin between 1921 and 1922 owing to the struggles between the Republicans and the British. The bust of John F Kennedy, presented to commemorate his visit to Cork in 1961. The Silver model of the Steam Packet Sirrus, built as a trade ship between London and Cork, which found itself racing to New York, holding the Blue Ribbon for the fastest Atlantic Crossing for a few hours until it was taken by the Great Western, which arrived later on the same day, but had set out some four days later than the Sirrus. And the Key that the long serving President of Ireland, Eamon De Valera, used to unlock Cork City hall. Each piece had some major part in the story of Cork, not just artefacts collected for the sake of collecting, each had its own significant place in defining the identity of this place, pieces touched by great men; Presidents, revolutionaries, navigators, poets, writers, artists and craftsmen. This was followed by a short tour of the City, to see the Shandon Steeple, which has a clock on each side and is known as the four faced liar, as the clocks are known for telling different times. This was followed by the wonderful Triskel arts centre at the old Christ Church, now converted for exhibitions, theatre, film, music and spoken word it is a fantastic resource for the arts. Lunch was in the Farmgate Café in the English Market, a wonderful light airy space on a mezzanine floor overlooking the market, where diners can sit at the long shelf along the railing that lines the edge of the café. The dishes are all local, and produced using the market produce. The Corned beef with Cabbage and Mashed potato is a delight not to be missed. It gets busy around lunchtime, but the staff are really helpful in finding and saving you a seat. 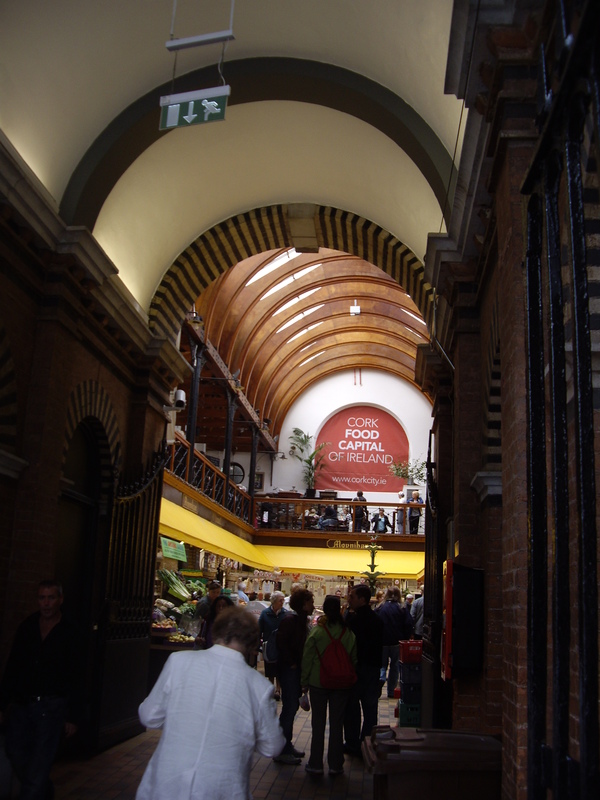 Entering the English Market - The Farmgate Cafe on the mezzanine. It was over lunch that we met with the Cork Poet, Gerry Murphy, whose t-shirt slogan raised eyebrows but had clear reference to his terse, harsh, philosophical poem, Oedipus in Harlem, it was really quite funny. (I will leave you to Google “Oedipus in Harlem” by Gerry Murphy, to get the idea). Cork is full of poets, really good poets or if not poets, people who are interested and will talk about poetry and their love of words, Gaelic or English. It was really refreshing not to be seen as if I was some sort of oddity for being a poet, not to have twee verse quoted to me, but to have meaningful discussions about my work, their work, places to read and poets to look for in the bookshops. The afternoon was spent in Cobh (pronounced Cove) this is the main Harbour in Cork and was once known as Queenstown. It is from here that the Titanic sailed on her final voyage, and where the bodies of the dead from the Lusitania were brought. 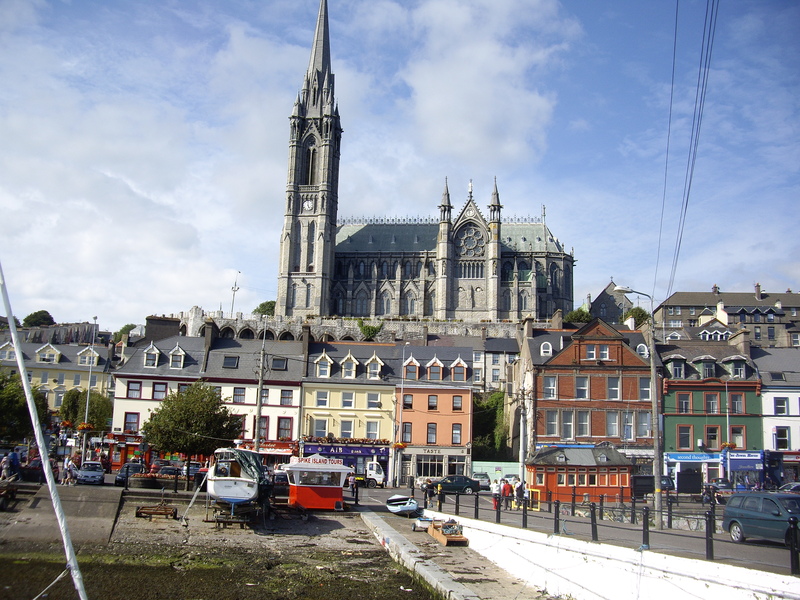 The Cobh skyline is dominated by St Colman’s Cathedral, a Neo-Gothic building in grey granite. St Colman was a 7th century poet who was ordained into the church at the age of 50, having been baptised by Brendon the Navigator, later St Brendon. Out in the harbour is Spike Island a former prison, known as Irelands Alcatraz, the prison is now closed but there are regular boat tours to the island. The day finished quietly as I said goodbye to my hosts at around 6:00pm, I went to the local pub for a beer and sandwich and retired to my room to reflect on the day. This was the day that most of my poetic ideas will stem. So much to think about! Wednesday was for the 70 mile trip to Limerick for the reading at the Whitehouse. The morning was free so I took the opportunity to do some shopping in the city, buying some gifts of Cork Silver and some books of the poets who I had met or had been recommended, Gerry Murphy and Derick Mahon to name but two. The afternoon saw Paul and I head to Limerick stopping off at the ancient sites at Lough Gur. Lough Gur is a horseshoe lake that has been the home of civilisations since early times, unkempt island Cranog’s nestle against the shoreline, overlooked by Knockfennal and Knockadoon. Ring Hill forts, bleak defences with visions and the trail of the breeze. The Neolithic villages and tombs, wind and time robbed of bone and pot and flint, cracked tablet rocks pivot on age. The Grange stone circle, the largest in all Ireland, where an ash tree smothers a stone, the stone on which the solstice sun would reach, the ash tree breaks the magic, lets the circle lie without its voice. But there are whispers here, old Gaelic poetry that lives on earth pages, tell of a mysterious, enchanting, wonderful place. The evening reading at the Whitehouse will be discussed in a further blog post. I was told before I went, that Cork would grab me, hold me and capture my attention. It lived up to all of this and far more. Cork is a clean, safe, friendly city, where the pedestrian lights beat and tell you how long you have to cross, where the buskers all deserve recording contracts, where they close the streets to traffic during the day, it is busy in a comfortable way, where even the unkempt buildings are attractive and entice you in. Cork knows its history, remembers the journey, but does not labour the point as it welcomes visitors to breathe and be part of its glorious future and despite the recession there is a really optimistic approach to life and most of all for me there is Poetry. I have not discussed, Hurling, Christy Ring, Branding of Cider, the Crawford Art Gallery – and there is so much more that I did not explore, Kinsale, rest of County Cork, the ring of Berra. It was a pleasure and an honour to be invited as their guest and I am sure that like Gallagher’s Bad Penny, I will turn up again. MY LOST POETS THIS WEEK is Colmán mac Léníne (530 – 606). There are supposedly two existing poems of Colmán mac Léníne, one dedicated to the life of St Sennen and the other to the life of St Brendan, both were written in Latin. Despite much searching of the internet I have not been able to find either of them. Very little is known about his early life, what is known about him seems to suggest he was born and raised in Munster and studied poetry for 12 years to become a Filé or poet, he was considered by his contemporaries as the royal poet of Munster. Following his conversion to Christianity, at the age of 50 he became a monk and was giving land in Cloyne by Coirpre mac Crimthainn the King of Munster, where he was to found a monastery and is said to have left a school of Poetry. He was later venerified to be St Colman of Cloyne. As I previously stated above the Cathedral at Cobh is dedicated to him. He is to a large extent still a lost poet and I would appreciate seeing copies of the two poems, should you come across them. Le gach mo chairde i gCorcaigh agus i Luimneach, Go raibh maith agat an méid sin do do fáilteachais agus ádh mór don todhchaí. If I am in Cork it has to be The Essential RORY GALLAGHER. A shorter blog this week as I am currently on my reading tour of Southern Ireland, so my blog this week has been pre-written and scheduled to be posted as I board the plane. News from the Poets Trail – Penny Harper’s poem installation from the first phase of the Poets Trail has now been installed in its final position along side the path on the drive at Polesworth Abbey. 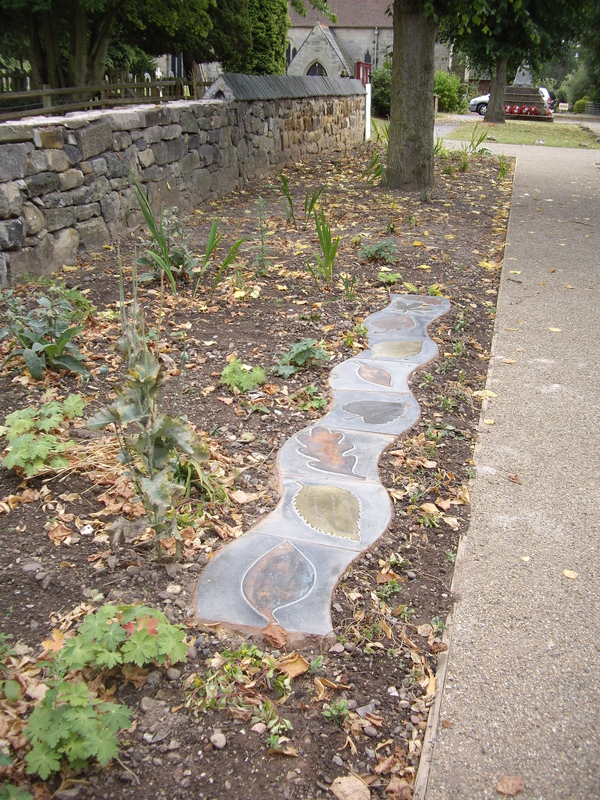 The poem on Osanna the abbess from 1100 to 1135 has been laid out in the Sensory Garden, whilst the driveway was refurbished as part of the Gateway refurbishment project. It has now been permanently installed and looks wonderful in its new location. A note for your diary, for those who are interested in the GRAFT project, that I have mentioned before on this blog. 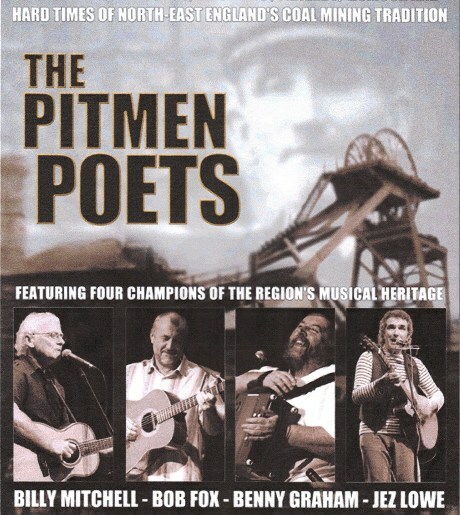 The Pitmen poets will be performing at the Century Theatre at Snibston Discovery Park, Leicestershire on 1st October 2011, performing songs from the North East Coalfields following in the traditions of one of my Lost Poets Tommy Armstrong (if you look carefully, you can see Tommy in the background of the poster) and also another poet who may well feature as on of my lost poets that of Joseph Skipsey. My lost poet for this week is Morten Nielsen, (1922 – 1944). I cannot find a photograph of Morten, which is unfortunate, but then again it allows me to picture him as I want too. I have the freedom; to do this, to read his work and to capture in my mind the importance and privilege of being free. Morton Nielson was born in Alborg, Denmark in 1922. He was a Danish poet who is recognised as being symbolic of his generation’s desire for freedom, which saw him being killed, aged 22 for his participation in the organised Danish resistance against the occupying German forces in World War II. Not an agitator, Not a martyr – Morten Nielson was a poet. His poetry expresses his thoughts and those of his countrymen, faced with living under the forces of occupation, his work in contrast to his contemporaries, is still read in Denmark. A full collection of his poems was published ten years after his death. His poem Death is a very well crafted poem, where each verse builds upon the next from Death as the acquaintance he once met as a child when some one dear to him died. To the ever present stalker, always around him, living on the edge of everything he does, always on the side, as an almost omniscient presence, living in the light above a forest floor or as a moan that hovers over the sleepers mouth, Both the poet and Death are aware of each others presence and that one day they will meet. It shows him living with death and not fearing it, almost accommodating it into his life, always aware that on the edge of freedom lives those forces that want to suppress. Freedom does not come with a blissful, contentment, it is something that is fought for and for which those of us who enjoy it, have to take a carefully, considered responsibility in how we use it. Captures moments in past summers and compares them to a moment in a war time summer. Rain is the central theme, cleansing, life giving, taking pleasure in the stillness. There is very little on the web about Morten, sketches of his life, the two poems I mention above and no photographs. But the two poems are magnificent examples from a man tied by the bonds of war and occupation, with no certain future, capturing a presence in a way that continues to touch people. Morten Nielson, shook the hand of Death in Copenhagen in 1944, a city where today, I have many friends, a city that has many freedoms not least the village of Christiania, the original hippy village, built from the remains of a military barracks. Freedom is not to be taken lightly, on the edge of freedom, on the side lines, in the breath of the sleeping, in the light above the forest floor stands death, waiting to extinguish it. The considered responsibility that comes with Freedom means that we take care in our actions, that we consider the outcomes and the impact on others. That we do what is right and not take ourselves on a selfish ego trip, just because we can, we need to weigh up the consequences. Some may argue that this is not freedom, that the self controlling barriers are the Death that is trying to extinguish it. So many people see Freedom as the means of criticising the current order of the things; I like to think that freedom is the means that allows me to offer alternatives. THE ARCHAEOLOGY OF AN IRISH POEM. Predictive web browsers that won’t let you finish typing your search criteria, before they offer you something that you don’t want. The words settled and found me tired and caught up in other things, which meant that I sadly did not make Poetry Bites in Birmingham last week. By the Friday I was ready for a break and so we headed down to Southampton to stay with family. It was a wonderful weekend away from the pressures. We spent a lot of time on the beach at East Wittering, which has now seen me glowing like the winning crustacean at a Lobster Fest. As I walk down the road cars stop and wait for me to turn green. My thoughts this week turn to my trip to Eire as part of the Cork-Coventry literature exchange. I will fly out next Monday morning for three days of readings in Cork and Limerick and no doubt a fair amount of stout and cider. 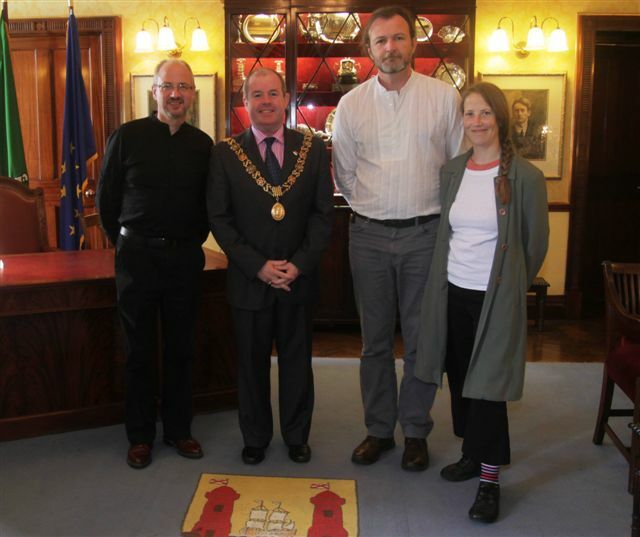 The Cork-Coventry literature exchange has been running for many years and came out of the town twinning initiatives, that sees poets from both cities visiting to read and perform, share ideas and make new friendships. It is co-ordinated by Night Blue Fruit/ Heaventree in Coventry and O’Bheal in Cork. I am really honoured to be part of it and to get a chance to meet up with the friends, Paul Casey, Billy Ramsell, Sue Cosgrave and Joe Horgan who came to Coventry last year and were able to perform at Polesworth. The Cork poets will return to Coventry at the beginning of November and I hope to be able to host them again at Polesworth and maybe to be able to show them the rest of the Poetry Trail. Eire has a deep tradition of poetry as well as music and dance. Poetry is part of the Irish culture, it is respected and admired, it is a recognised feature in peoples lives far more than those of us from England. I hope to explore the reasons for this whilst I am over there. I will share my adventures in Eire in my blog in a couple of week’s time; I am hoping to get some ideas for a series of poems that give you my impression of the spirit of the place. Tonight sees the latest broadcast from Radio Wildfire, or should that be “hears the latest broadcast.” Dave Reeves the man behind the West Midlands premier spoken word radio station available on the net, tells me he will be doing a feature on the Great West Midlands Poetry Relay. Dave was one of my fellow poets on the journey and he plans to feature recordings of some of the poems. I am not sure whether mine will be included, as I only got the recording to him late last night but it will be well worth a listen in any case. The show is on at http://www.radiowildfire.com/ at 20:00-22:00 UK Time tonight after that it will be on the loop which will be available for the following month until the next broadcast. 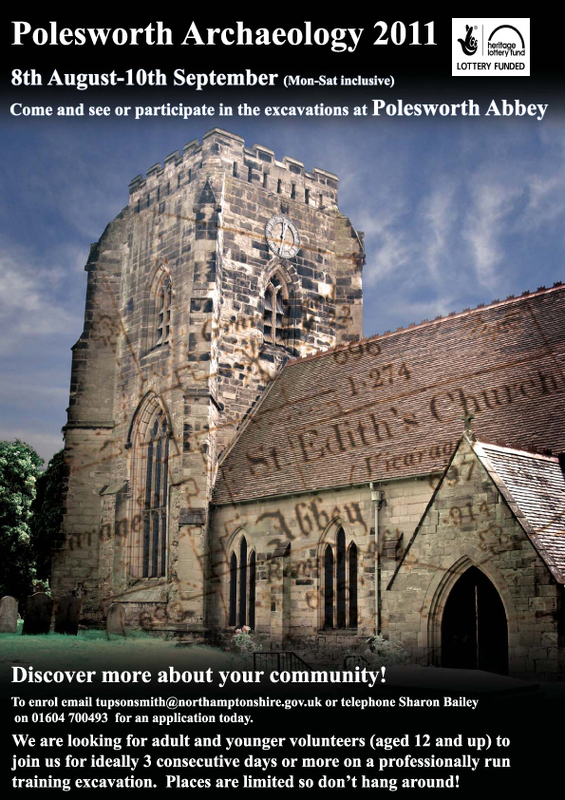 There is to be an archaeological dig at Polesworth Abbey. Those who know me really well, will know that when I was at school I wanted to be an archaeologist and indeed during the hot summer of 1976, I spent a month on the Mucking Hillside, near to Stamford-le-Hope in Essex pursuing this great ambition. Working under the guidance of renowned Archaeologist, Dr M.U.Jones. However despite this teenage enthusiasm, my career in ruins never materialised. So I was delighted to learn that during in August there will be an Archaeological excavation taking place at Polesworth Abbey. Following on from a pilot dig that was performed last year, which revealed more of the foundations of the Abbey, it is proposed to do some further excavations during this summer and next. I can’t take part in this years dig, unfortunately, as I have prior commitments, but I will certainly take part in the afternoon sessions where the archaeologists discuss what they have found and the significance of it all. There is also a plan to put a test trench into the mound in the churchyard. The mound is steeped with myth and legend and no one really knows whether; it is a Bronze Age burial mound or just the remains of some of the rubble left when the abbey was demolished in the 16th century. So that just adds to the excitement for me, although I think some might want to leave it as it is and keep the legends alive. I will certainly find out my trowel and plan some time for the dig next year, but this year I may just write some archaeological poetry. The dig runs from 8th August to 10th September – Monday to Saturday inclusive. If people want to take part then see the details on the poster. My Lost poet for this week is Else Lasker-Schüler (1869 –1945). Else was a German Jewish poet who lived a bohemian lifestyle in Berlin and is one of the few women poets who are considered as part of the expressionist movement. She was born Else Schüler in Elberfeld in 1869, her father was a banker and her mother Jeanette was the main inspiration for her poetry. 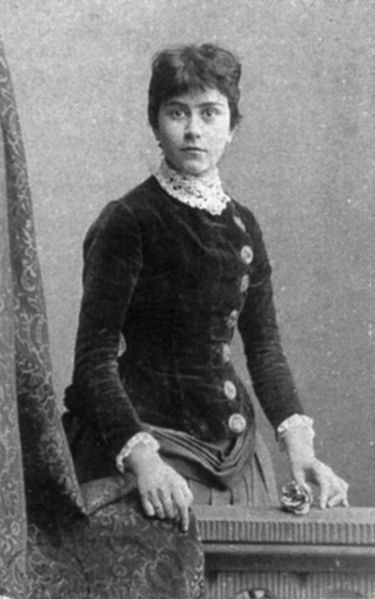 In 1894 she married Jonathan Berthold Lasker and moved with him to Berlin. Here she initially trained as an artist, but it was her literary works that saw he brought into the public consciousness with her first poems published in 1899 followed by the first full collection, Styx, in 1902. The majority of her poems concentrate on the themes of love, but also brings in religious imagery, she moves between the two themes with an easy flowing transition. She was not hampered by poetic structures and is often free of the influence of poetic forms, which gives an inner more concentrated expression of her themes. She was not averse to expressing the voice and words that were specific to the person, capturing the voices of her time. By 1903 her marriage to Lasker had failed and she divorced him. She married George Lewin and coined his pseudonym Herwarth Walden. By 1910 she was divorced again, but had continued to write both poetry and plays. He most important play Die Wupper was published in 1909, her mother being the main character. It was first performed in 1919. After the breakup of her marriage with Lewin, she found her self penniless and relied on the financial support of friends such as Karl Kraus. She developed a deep friendship with Gottfried Benn, which saw its intensity delivered in a series of love poems dedicated to him. In 1927 her son, Paul, with Lasker, died and this left her with a deep depression. This was further compounded by the rise of the Nazi’s which left her unable to continue to work in Germany, she fled to Zurich but was unable to settle here and by 1937 she had settled in Jerusalem, where she died of a heart attack in 1945, she was buried on the Mount of Olives. She is commemorated both in Berlin and Jerusalem. Her poem Ein alter Tibetteppich or The Old Tibetan Rug, is a good example of her poetry, it was this poem that provided me with the appreciation and connection with her work. My poem The Melding, which has been read at several weddings, uses the theme of a Celtic Love knot and that the strands represent the bride and the groom, woven together by marriage. Else’s poem explores the same themes, not necessarily a marriage, but sees the lovers as threads woven together into a Tibetan rug. I was not aware of Else poem when I wrote mine, I have, however wondered at the affinity of thought. Project Arts page for Else. Some of her poems in German with English Translations.